My men and I are heading to Stockholm in June to visit family and the boys (22 & 19) have been wondering what there will be to see and do. 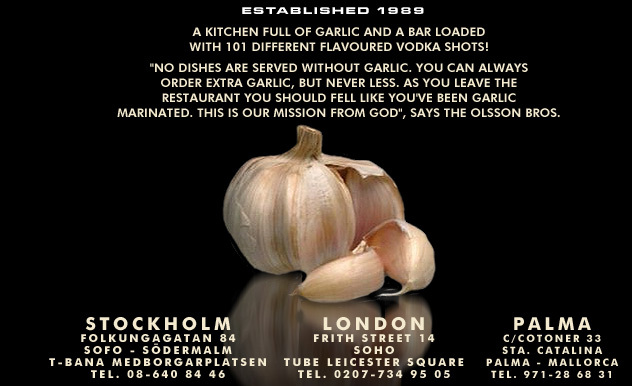 A restaurant called Olssons Garlic and Shots. Plus one of my own must-sees, the Stockholm Public Library designed by Gunnar Asplund. Yesterday, I tweeted a couple of questions at the curated account for Sweden. Hi @sweden! My family is visiting Stockholm in June. What do you recommend for young adult males in the way of things to do and see? The new Tele2 Arena – concert and soccer stadium (@Sweden / Emma) – also bowling alley inside. My second question for @sweden and Swedes: suggest some good novels by Swedish authors/set in Sweden to read before and during visit. Millennium Trilogy (3 eBook set) – The Girl with the Dragon Tattoo, The Girl Who Played with Fire, The Girl Who Kicked the Hornet’s Nest (I have copies but haven’t read them yet.) There is a Millenium walking tour that covers some of the sites in the novels. And then Trip Fiction piped up (@TripFiction) to tell me about their curated book site that helps you choose books by destination! How did I not know about this site before?